Carrying two phones is a major pain. You’re essentially managing two separate computers and their incessant neediness: they have to be charged, updated, kept in sync, and most importantly, not misplaced. Some people don’t have a choice, as they’re issued a work device but still want a separate phone for personal use. If you’re living this nightmare, there are some clever apps and even hardware options that might eliminate the madness. Some apps will assign you a second number with which you can receive calls or text messages and use separately from your main line. And slowly, more smartphones are starting to come with a dual-SIM card tray, which would give you more freedom. Whether you own your own business or just want to more closely guard your number, here’s a sampling of the two-number options worth considering. One app to arrive on the scene recently and gain quite a bit of traction is called Line2. It’s pretty straightforward: you sign up for an account and select a phone number, which you get to pick from several choices based on the area code you want. Once that’s done, it’s $10 per month for unlimited texts and inbound calls, 5,000 outbound minutes, call screening, and a few other features. You can try it out for free, but free accounts are limited to calls and texts with other Line2 numbers. Line2 puts an entire phone number and communication capabilities inside of the mobile app. During a brief field trial between another Line2 account I found the calls to be reliable and offer good quality, just as I’d experience with my regular number. There’s a persistent notification bar that lives on the top of your screen, which is convenient to use as a launch pad for access to Line2 services. If you like to keep the notification center clean, you’ll want to disable it. Line2 might serve as an ideal option if you want another number to give out as your business line, complete with the ability to send calls straight to voicemail after hours on weekends thanks to several built-in controls. The design could use a few splashes of paint as there’s some persistent Holo design hanging around, but the app definitely gets the job done. Another good choice, and probably my favorite in this group, is Sideline. Much like Line2, you get to choose a new phone number and use the app for phone calls, text messages, and voicemail. It works over your carrier network, although Wi-Fi calling is part of the $3 per month Pro upgrade, which also kills the ads from the interface and ensures that your number doesn’t disappear. Unused numbers are sent back to the Sideline pool after 30 days of inactivity. Sideline has a great interface and inexpensive plans for a second phone number. I like the interface of Sideline better than Line2, though the banner ads on the bottom are quite prominent and probably not something you want to live with permanently. Sideline also offers a few smart features that can automate some processes, like setting up auto-replies, selecting a new text tone, and setting up a do-not-disturb time so you can have your second number be off limits during leisure hours. The design is elegant and in keeping with Google’s aesthetic, and I found the app to be reliable and rapid. If you like the cost level of free, then there’s always Google Voice to consider. The service goes back seven years; it came about in the days when business users who had to juggle an office line, home landline, personal mobile, and a work-issued BlackBerry. Just like the other apps you get to pick a phone number, which you can use for free text messages and phone calls. International calls are relatively cheap, and it includes several nifty features: Google Voice calls can ring multiple numbers at once, screen your calls, and transcribe your voicemail messages (although sometimes they’re hilariously wrong). Hangouts lets you make, take calls and send messages. 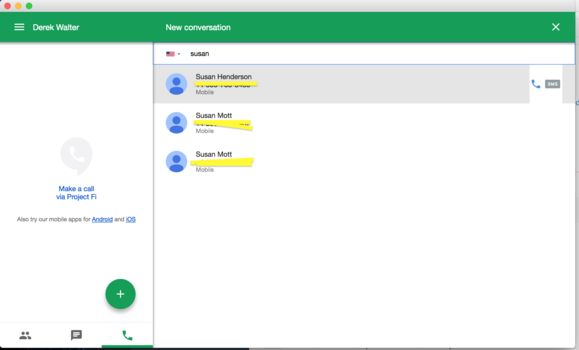 To get the full list of features, however, you’ll need to use Google’s Hangouts app. That’s where SMS/MMS messages and the dialer live, which also integrates with your Google contacts. The app isn’t exactly a shining star in the Google lineup, but some recent updates have ramped up its stability and squashed the most annoying bugs. The big question mark here is if Google Voice will stay a separate service or get swallowed by Project Fi. If you move to Google’s MVNO, you have to use your Google Voice number or surrender it forever. Voice hasn’t gained any major features in quite a while, so the future of Google’s support for the service is still a little murky. There’s also another option that’s slowly gaining traction: dual-SIM phones. The primary benefit would be with international travel. You can still get messages from your primary SIM, but use a temporary local SIM for data since most carrier international plans are ridiculously overpriced. You may still be able to use your primary number for calls, however, if your carrier supports Wi-Fi calling. However, it’s not a terribly popular method here in the U.S. right now. Probably the best dual-SIM Android phone you can get in the U.S. is the OnePlus 2. Most other dual-SIM phones are budget models that might not be all that appealing to use as your daily driver. And U.S. carriers are, at this time anyway, loathe to offer support for such phones, which would require granting you two separate numbers. However, if you want a temporary solution for an upcoming trip overseas then a two-SIM phone would be great to have. In the last few years we’ve seen quite a change in how people use their numbers. Many gravitated towards just one number by eliminating landlines and office numbers, but there’s been a resurgence in the interest of gaining more privacy. Dual-SIM phones hold the most promise in this regard, but for the time being you’re probably best served by all the aforementioned apps and services.